It’s been a while since I did a namul post. So, here is another one for the namul series! Namul is the Korean macrobiotic way of using minimal spices and sauces to create yummy dishes with vegetables and weeds that grow in the fields. 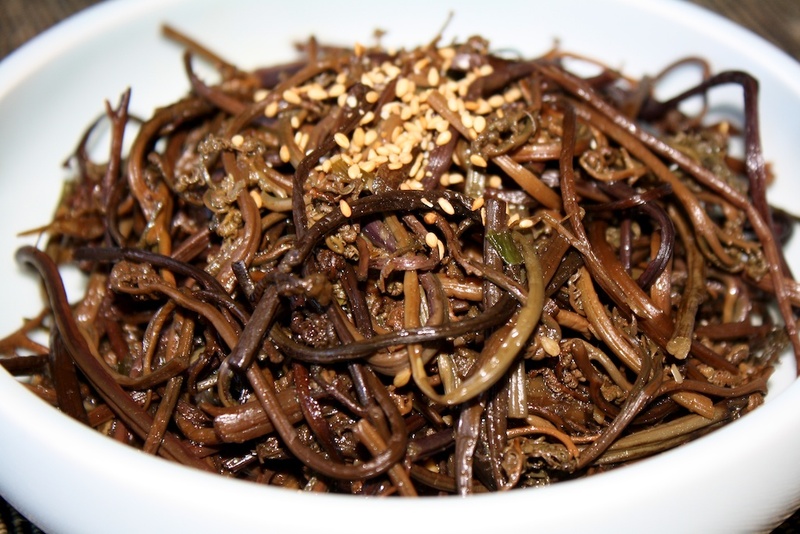 This one is namul banchan made of gosari (fern bracken). Gosari has a lot of calcium and detoxes the inner organs of your body. 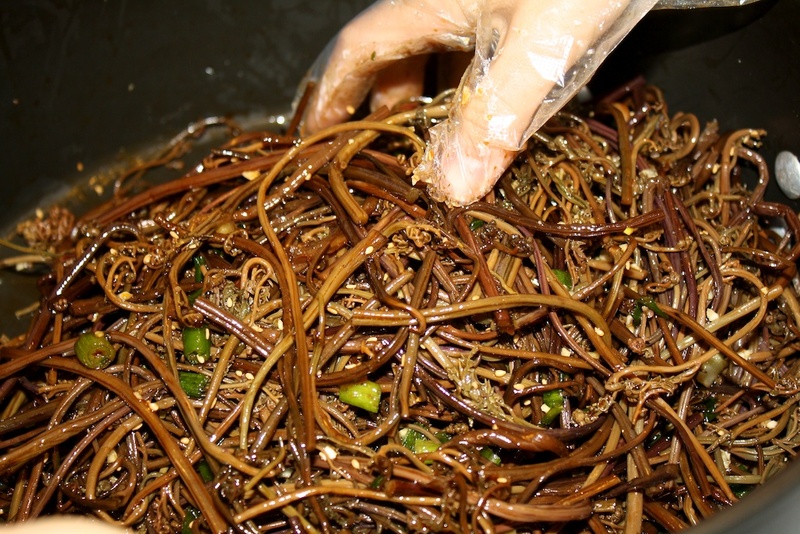 Koreans also use gosari for insomnia, and Native Americans even used gosari for bronchitis! Gosari-namul goes great with other namuls, like a mix of moo-namul, kong-namul, chwi-namul, marun-hobak-namul, and shigumchi namul. And all the different colors of white, yellow, green, look very pretty together. The spread of various namuls are particularly popular on the Korean traditional holiday Dong-jit-nal (the day of the year when daylight is shortest and night is longest), Koreans eat a spread of various namuls and sweet red bean porridge. Mmm… the thought of Dong-jit-nal makes me crave sweet red bean porridge as well! 2. Rinse and wash the fern bracken well multiple times so there is no more brown water coming out (it will be bitter if you don’t wash it well), and cut into 3 inch pieces. 3. 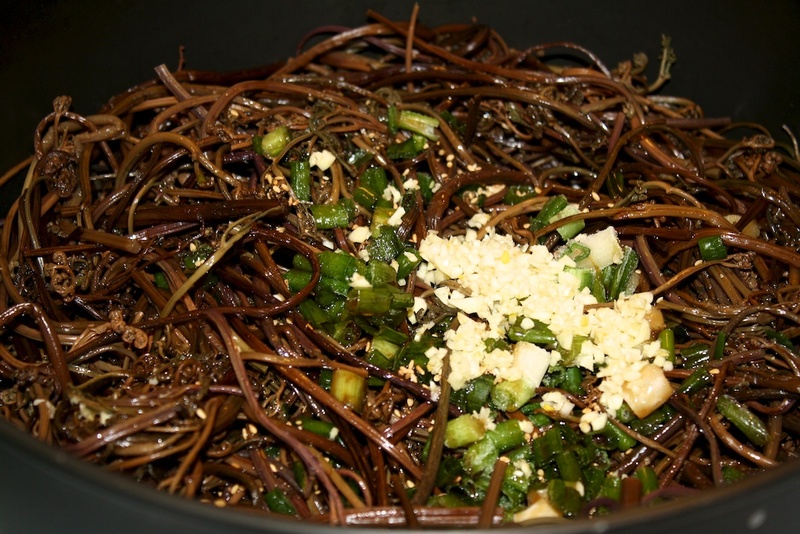 Add fern bracken, salt, black pepper, garlic, soy sauce, scallions, and sesame oil into a bowl and mix well. 4. Heat a wok/pan and stir fry on high for several minutes. 5. Add a little water, cover with a lid and cook for 10-20 minutes until tender. 6. Remove the lid and stir mixture again for a while so it’s not too watery (a little bit of water is okay). 7. Remove from heat and add sesame seeds and mix well. Taste to see if you need more soy sauce, sesame oil or a sprinkle of salt. 8. It’s ready, serve with rice and other banchan! 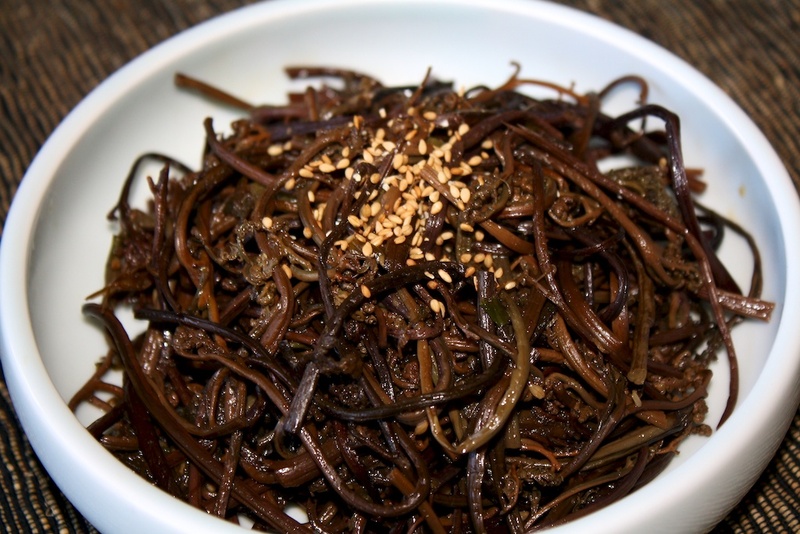 Again, as any namul banchan, it is great as a main ingredient in bibimbap as well, enjoy! Boil gosari around 30 minutes, so it’s not too tough or too mushy. Soak the cooked gosari in cold water overnight. Add the ingredients, more or less according to your taste – and mix well. Mmm…. Another Korean namul dish, so good with rice and any other banchan! I’ve always loved this in tolsot bibimbap but it wasn’t until last year that i found out it was bracken fern. Yum! Yes, I agree! It really is good in bibimbap isn’t it? 😉 Having namul in bibimbap makes a huge difference. Dolsot bibimbap is even better…. Yum! I followed the link at Koreataste and I’m glad to have discovered your blog! I also like the earthy flavor and chewy texture of this. Your photos look so~~~delicious! 😉 Hi Alice. Yes. It is pretty yummy!!!! The recipe turned out well. It was delicious. 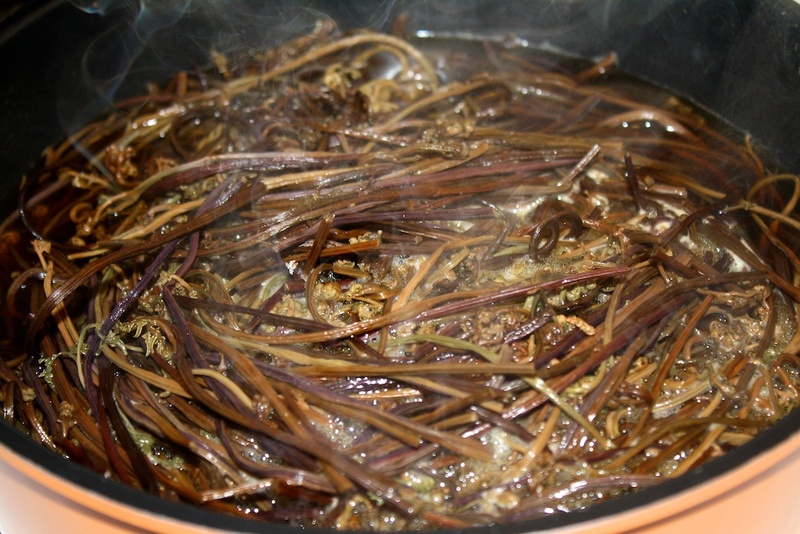 If I have left over boiled, soaked fern bracken that hasn’t been sautéed can I freeze it? Or is it better to put it in the fridge.. And how long is it good for? I soaked the whole bag instead of 1/2……. Thank you in advance for answering my questions. We haven’t tried that but I’m thinking it should be fine. It also makes a great addition to a spicy soup! I learned a lot with this blog. A lot of gosari or fern bracket grows in our area, and didn’t realize that this is edible, until I find this information in your blog. I like the recipes you share and I will try to prepare and harvest our fresh gosari. Thank you in sharing this information. 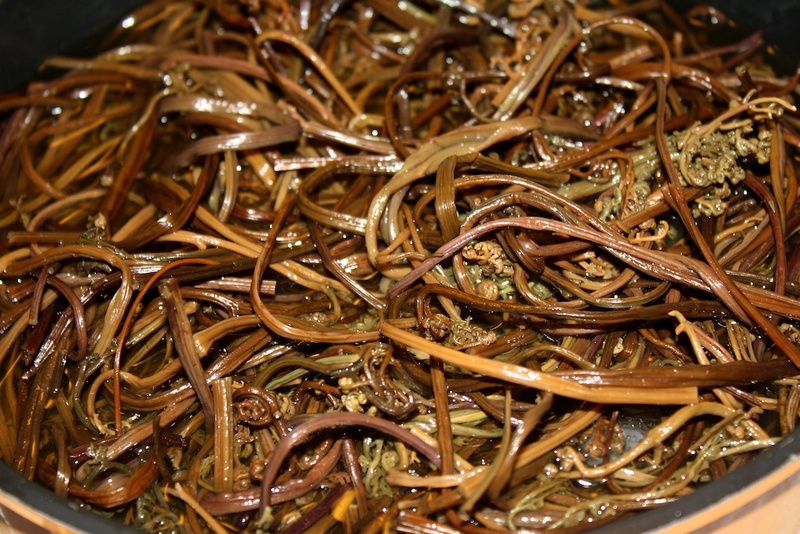 This fern banchan in South Korea was my all time favorite banchan when eating a Bibimbap. Could you please post an acorn salad? Acorn salad is my number 1 favorite food in South Korea. Thank you for posting and sharing this recipe.